This article is to give a little insight on the crazy and funny things ladies do after break up. 1. DELETE HIS NUMBER: This is always the first move. As soon as the guy breaks their heart, the next thing is to delete his number. But you know what’s annoying about this? It doesn’t change anything because we still have the ex’s phone number stored up in our brains. Ask them in five years, they still remember! 2. THEY BECOME RELATIONSHIP EXPERTS: I know most people can relate to this. We all have that friend who had a bad break up and next thing, she thinks she has a BSc in dating. Relationships become her favourite topic. She suddenly wants to give relationship advice at the slightest chance, even if hers did not work. She knows how not to date a guy. 3. BECOME BORN AGAIN: When a guy whom they loved so much breaks their hearts, next thing is church. They forgot God was their companion before the break up, but as soon as the break up happens, they have the front row in church, their voices would be the loudest during service. But as soon as they find love again, it’s back to square one. Thank God our God is a Merciful One! 4. 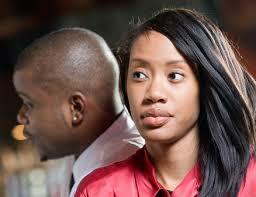 TEAM SINGLE AND LOVING IT: Ladies always have a sense of empowerment after a bad break-up. You start to see things like, #teamsingleandlovingit, #teamsingleforever etc even though we are dying inside. We suddenly have our little NGOs and become allergic to men. I pity some toasters during this period because they will smell pepper! 5. EATING AND DRINKING: It’s after a break up that we remember that food is our best friend. They would buy the big bowl of ice cream and the biggest bowl of KFC chicken. The truth of the matter is, it doesn’t make us feel any better but we do it anyway! 6. LISTEN TO DEPRESSING SONGS: They dig out Adele’s album or watch ‘A walk to remember’ and lay on their beds all day, crying their eyeballs out after every scene. We all know how depressing Adele’s ‘Someone like you’ is or ” Hello”. Even when you are in the best relationship, that song just has a way of making you feel sad. 7. MOOD SWINGS: After a break up, everything reminds you of the ex. One second they are happy, the next you see the type of car your ex owns, or smell his cologne somewhere and they are sad. Most friends avoid these ones! 8. STALKING: This is a common factor amongst the ladies. After a bad break up, they would stalk their ex on Instagram, Facebook or even dial his number a couple of times with a strange number. Then when he says hello, they hang up or just remain silent. We know some of you are guilty. Women are the best CIA agents! that fun she would never have had with her ex. It is always a plus when they know that their ex would be at the event. If their ex will be there, they would kak up (dress to kill) just to make sure he realises what he is missing. Besides, Mr. Right can be found anywhere. 10. ONTO THE NEXT ONE: Most of the time, they turn to good girl gone bad if they can’t handle themselves. Those toasters she kept on hold while she was dating become her besties and we all know the things that go along with that. I’m sure once in your lifetime, you have done at least one of these listed above.